Smashing Pumpkins frontman, Billy Corgan, has been around long enough that when he talks about music—of 90s bands staging a comeback, of preserving one’s integrity in the face of commercial pressure, or of American Idol—we tend to listen. And listen long and hard we did along with other members of the media present during their press conference at the EDSA Shangri-La Monday noon. The band is in town to support their newest album, Oceania, which, to say the least, is the best to have come from them in a long while. 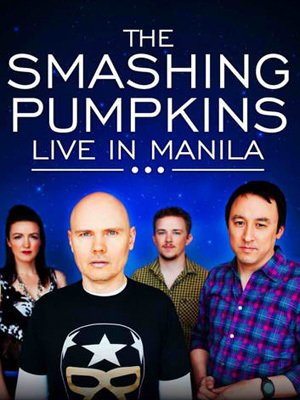 We reviewed it as having “the right amount of angst, radiance, and evocative moments to declare the return of The Smashing Pumpkins.” They will be playing tonight, August 8, at the Smart Araneta Coliseum, in a performance that promises to be truly immersive, backed by visuals to match the psychedelic element present in their work. The album will be played in its entirety. How about the classics? Well, don’t worry, they’ll be performing classics from their award-winning, multi-platinum body of work too. Sure, the band roster is 75% new, with Billy being the last original Pumpkin. But if the new album’s any indication, we can trust bassist Nicole Fiorentino, guitarist Jeff Schroeder, and drummer Mike Byrne to give the old material justice. Oceania, their 7th full-length record, is a part of their 44-song mega-project Teargarden by Kaleidyscope, from which three mini-volumes have already been released since 2009. If 44 songs sound ambitious, well, just remember that it’s Billy Corgan we’re talking about here. And if there’s anything we know about him, it’s that the guy could talk. Here, have a listen. "I was going through a difficult time in my life. There was a real, personal sense of alienation in love and in my life. I’m connected to friends all over the world, which is incredible, but yet we don’t talk on the telephone anymore. You feel connected but you also feel a little bit more isolated. So there’s something happening with the whole world about how we’re connecting, and in another way, how we’re losing deeper connections. I think [the album] has something to do with that. It’s hard to describe. Even when I listen to the album, it takes me on a journey I don’t expect. It feels a little bit like I’m in a Stanley Kubrick film or something. There’s a story on the top, and there’s an unconscious layer underneath. So that’s how I feel about it; I don’t totally understand it." Let’s say right now my favorite Oceania songs are between “Pale Horse” and the title track, “Oceania.” They really connect to me personally. As far as all-time Pumpkins song, that’s really difficult. “Tonight, Tonight,” seems to be a good one right now. There’s such a beautiful response to it every night. It has that sort of special, magical feeling to it when we play it. "The live experience gives us a different opportunity to display the depth of the work in a different venue. I learned that as I got older to be less personally-connected to whether somebody connects to it this way or that way. 'Are people connecting?' That to me is all I care about." No Doubt, Blur, Green Day release New Singles!